Carmel Browne will speak about the very popular Begonia plants. Carmel has been her father's shadow all her life as she learnt about begonias and their botanical names and characteristics from a very early age. Long before the Begonia Society was formed in 1989, Carmel and her father were travelling to places to collect different begonias. Carmel has been president of the QLD Begonia Society for 14 years, as well as holding other positions, and has been the guest speaker at many Australian conferences, and also the American Begonia Society . She will be bringing unusual begonias to talk about and to sell. Jason Vella spoke about the very diverse products of the Eco-Organic Garden brand, which has solutions for killing unwanted bugs (mainly by stopping the reproduction cycle), unwanted grasses, and promoting the growth and well being of plants and gardens. Their very affordable products are available at our local Manawee garden centre. Jason recommended The Garden Guardians book as a source of management of problems in gardens. The above photo shows our guest speaker co-ordinator, Jenni Campbell, and president John Lyon posing with Jason and some Eco products. Our second speaker was John Northey, a police officer from Scamwatch, the Office of Fair Trading. His talk was enlightening as well as scary as he described the conditions relating to the return of goods, illegal store signs, and the different types of scams that are based on love (generally women fall for these), easy money (that's usually the men), greed, and computer hacking etc. Both speakers were very informative, with excellent pps displays, and their topics kept the audience attentive, even when they went over their time limit - I don't think anyone minded! Below photos, show Cassie presenting the Lucky Door prize, Maxina announcing the raffle winners and Erica with John displaying the Plant of the month (a magnificent begonia). Cut Flowe and Photo competition results, tours, workshops are shown separately from the headings above. The Buderim Hall was packed for March's meeting, with 13 visitors and 10 apologies. Elaine Davidson, the photo competition co-ordinator told how she and the judge were delighted with the 72 entries in the new format for this competition. Check out the report, under "Photo Comp" above. Manawee Nursery provided the Lucky Door prize and they have announced that they'll spend $2,000 promoting their sponsorship of the October Buderim Garden Festival. Maxina called the lucky Raffle Prize winners to select their prizes. Roslyn Leslie of WILVOS gave a most interesting, entertaining and informative talk about her role as the Community Awareness Officer of WILVOS. She displayed the pouches, ice cream containers, warm water-filled cask bladders etc that are used when an injured animal is rescued. We learnt to look for a 2nd ring tail possum baby in a dead mother's pouch, that hurt baby birds are best looked after by their parents, don't feed any wild life, and very importantly to keep domestic pets locked up at night .... and much more! Rosemary Simmons is a new Garden Club member who talked about moving plants from different climates to this sub tropical area. She has certainly moved around - from Brisbane to acreage at Pine RIvers, to Maleny (where she was involved in the start up of Maleny's "Gardening on the Edge") to the cool climate of Olinda, to Bowral to other places to eventually settle up here. The Buderim Memorial Hall was packed for the first meeting in 2019 on February 8th. Wendy Skelton of "Just Geraniums" gave a most interesting talk about the different types of geranium - true, ivies, zonal, scented and the old fashioned pelargoniums. This was a most professional presentation and most enjoyable. Some members even said this was "one of the best" talks that we've had, and there were many questions from the audience that Wendy enlightened us with in excellent answers. Gardens: 39 Berlin Road Mount Berryman 6am – 6pm/ 7 days Over 400 plants for sale. Wendy is pictured below with committee member Elaine Davidson. Our Expert Gardening Panel of Ken Evans, Robin Porter and Steve Dickson, again impressed and also entertained the audience. Steve spoke at length from his notes about Garden and Lawn Maintenance in the hot summer weather, with Ken and Robin adding more information. Steve also announced an upcoming Workshop. Details TBA. Edna Walling Garden Group - meet 3rd Monday month 6:30am - need new volunteers. Newsletter - members who can’t print their own to take a copy. At the Garden Club's AGM on 9th November, John Lyon presented his Annual Report and Lesley Doyle presented her Financial Report - both of which show that the Club is operating on a sound physical and financial basis. The 2019 new Management Committee is shown under the heading Committee above. A most entertaining talk was given by the guest speaker, Dr James Lergessner (pictured), his topic being the "70 is the new 50". He is a multi talented author, historian and speaker who amused over 100 people in the audience. John Lyon also announced the appointments of Maxina Williams as Club Hostess and Noel Williams as Official Club Photographer, and he moved a vote of thanks to outgoing committee members Elizabeth Hales and Carole Willis. Shirley McDonald presented the trophy for most points in the monthly flower competition to Elizabeth Hales. Shirley and her team were thanked for organising this competition each month and Frank Tucker and John Sargaison who have the hard task of judging the wonderful exhibits. Full results are under the Cut Flowers heading above. John reported that the Festival made a healthy profit of over $5500.00, with some final accounts still outstanding. The final result will be known by the next meeting. Vonnie presented the Lucky Door Prize of a Peace Lily, and Erica gave us info regarding the Plant of the Month, Leaucanthemum, Daisy May.. commonly known as in the Shasta Daisy family. Maxina, with the assistance of Lois and Patricia led the main raffle with many prizes, including 15 boxes of plants which eventually found homes.. The BGC Plant stall at the Festival raised well over $2000. The meeting ended with a mandatory Annual Fire Driill followed by another delicious afternoon tea, thanks to contributing members and Caryll and her team. There is a proposed bus trip to Government House, ( 68 Fernberg Road, Paddington, Qld,) with lunch at Brekky Creek Historic Pub and a possible nursery visit on the way back planned for late Feb. The second trip is planned, titled Christmas in July, at Maleny with a nursery visit and possibly Maleny’s historic cottage. Lindsay Robertson was awarded Honorary Life Membership for his dedication to the Edna Walling garden Project. A highlight of the meeting was that Lindsay Robertson was presented with Life Membership of Buderim Garden Club, for all of his work for the Club, especially leading the Edna Walling team for so many years. John presented him with his Life Member badge, to the applause of the members. Lindsay also received a Certificate of Recognition for the "Most Contribution by an Individual to a Garden Club" from the Queensland Council of Garden Clubs at their Awards ceremony and Christmas luncheon held recently at Mt Cootha. Photo below shows Lindsay being presented with this award by Dale Ardvisson, the Curator of the Brisbane Botanic Gardens Mt Coot-tha and the Sherwood Arboretum. Lindsay has now retired from this role, and Ken Evans, Leanne Crowe and Tom Crerar will now supervise a new group of gardeners to maintain this garden (adjacent to the Buderim State Forrest in Quorn Close, Buderim). In the new year, they will meet on the 3rd Monday of the month. *** On October 12th, Trevor Smith spoke about the lovely day lilies, with tips on how and when to propogate them, and pest control for them, with a power point display created by Leanne which showed some of the colourings of different varieties and topic headings. Many people were quick to acquire some "fan" samples at the end of his talk. The 3 Amigos - Ken, Steve and Robin, again provided some entertainment and also many words of wisdom with the members questions that they answered. In return, Steve had a question for the audience, and hopefully he was satisfied with the answers. Cassie and Erica presented the Lucky Door prize and the Manawee plant of the month, and there were many beautiful raffle prizes. Congratulations were given to Kevin and Daphne for becoming acreditted Show Judges which allows them to judge in FLower Shows anywhere in the world. The Club is very lucky to have them as members, and they contribute many fine specimens for our competitions in our Garden Festivals. This year will be no exception! Early membership fees were paid to Lesley, with over 140 members already paid up and rewarded for doing so with a free BGC bag. Fees are due in November at the AGM. The 2019 calendar is now available for $10. *** Dr. James G Lergessner is to be the guest speaker at our AGM on November the 9th . More details later. The September Guest speaker was Meredith Walker, a retired Heritage Consultant and a passionate horticologist. Meredith traced the existence of the Bottle trees from Roma up to around Buderim and identified places where they may be seen (mainly in roundabouts since their foliage is at the top of their "bottle-shaped" trunk. Meredith lives in Buderim and has been a BGC member since 2015. Her interest in the Queensland Bottle tree started forty years ago, when working for the National Trust of Queensland. She received a life-time achievement award for the National Trust in 2009 and an was appointed a member of the order of Australia (AM), for services to cultural heritage conservation, in 2011. She prepared a report about the history of trees In Buderim in 2014, and is active in bush regeneration and Indigenous reconciliation. Garden Club member Elaine Davidson continued her conversation about possibilities for small garden experimentation. This time, it was an area outside her window which originally was very ugly and bare. What a transformation she has done! - with trolleys supporting colour-co-ordinated pots of plants and hanging baskets in her Shade House. Elaine has been a member of The BGC for 4 years and was formerly on the BGC Committee as the Guest Speaker Co-ordinator. She was a volunteer guide @ The Sydney Royal Botanic Gardens, and moved from a large Sydney garden to a small courtyard garden in Buderim. The photo shows Elaine, Jenni Campbell (Guest Speaker Co-ordinator) with Meredith and 2 samples of bottle-tree foliage. 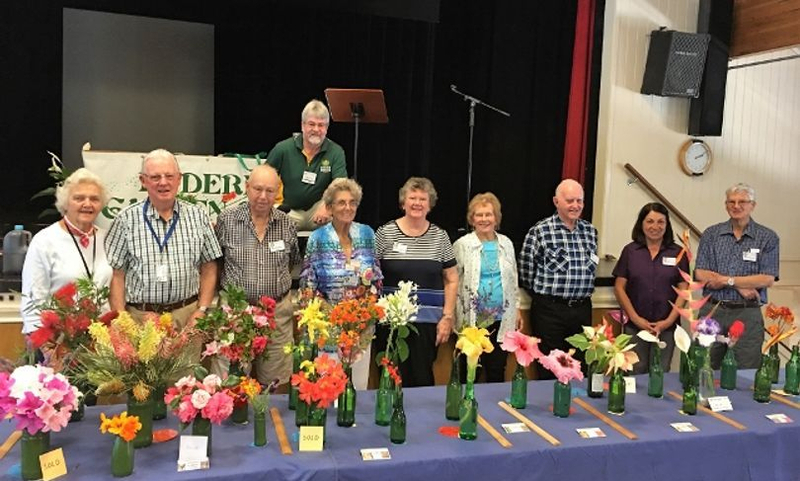 One of 10 Buderim Festival flags was displayed on the stage during the meeting, and Steve showed off his successful plantings from seeds of unwanted gladioli. The guest speaker was our Patron, Marjorie Van Roy from Manawee Garden Centre, who gave a most informative talk about fruit trees, and citrus ones in particular. The Three Amigo Experts - our member panel consisting of Robin, Marjorie and Ken gave an excellent, funny dialogue to the many questions that were asked to them. This is a very popular event from which everyone gains knowledge and entertainment. The Manawee-donated plant of the month, the Feather Falls, was displayed and presented by Erica. The Results of the Photograph Competition are noted under the sub-heading above. *** The speaker for July 13th's meeting was Jason Brooksby who is a horticulturist and gave a most interesting talk, mainly on best soil structure, different climate problems, mould, pesticides and general soil maintenance. He runs his family owned business, called Elemental Gardens which is based in Buderim. Guest Speaker co-ordinator Jenni Campbell welcomed him and also thanked him after his talk. Garden Club member, Jim Hales gave a scary analysis on the myths and major problems with the use of "Round-Up". It is not only dangerous if splashed into one's eyes, but is a major problem for world health!. Bev Gourlay (Schouten) spoke of the Irish Christmas in July (15th July) concert in the hall, and also the Foote Tapping concert (22nd July) at the Foote Sanctuary where there will be an excellent concert starting at 12 noon. The Garden Club is running a plant stall, and there will be a sausage sizzle and other stalls. People are asked to park in Eckersley Ave and walk down the pathway at 51 Eckersley to the Sanctuary. Gold coin admission and bring a rug or chair. Noel Williams urged members to sign a petition to be presented to the Council, requesting the restored Klaus locomotion be housed in a new structure in Buderim. Manawee donated The Lucky Door prize - a beautiful hanging basked, as displayed by John Lyon. *** The June 8th meeting speaker was Spencer Shaw of Forest Heart Nursery, who spoke about "Your Local Native Plants". Spencer had many examples (and eloquent descriptions) of native shrubs which were sold to many keen gardeners. Forest Heart is also the public face of Brush Turkey Enterprises that deals directly with the community. Monika described many of her excellent gardening tools, with Teddy, Maxina and Steve producing their useful treasures. The members' plant stall displayed many quality plants for sale. The Manawee donated plant was quickly chosen as the first raffle prize, with Patricia, Lois and Maxina introducing a new procedure for the raffle. Steve announced the cut flower competition winners which were paraded in the "flower walk" to show them to the audience. The May guest speaker was Stephen McLennan from All Rare Herbs, who came with an assortment of herbs that can be grown in our sub-tropical climate. Many of these were passed to members who were impressed by his vast knowledge of the herbs and their medicinal uses -including anti-aging ones that appeared to be working well for him. Stephen was duly thanked by Jenni Campbell, the Guest Speaker co-ordinator. The Three Experts Amigo - our member panel of Ken, Steve and Robin, were very informative and entertaining as they shared their knowledge, especially in answer to Robin WIlson's questions about preparing the soil for growing vegetables. We also learnt (from Monika) that bamboo can be killed by pouring round-up into an open "cell" immediately after cutting into it. Steve showed us a captured caterpillar that he's waiting to identify as a butterfly or a cabbage moth, and he'll then decide to eliminate or not. Past President and Honorary Life Member Rita Eaton has sold her house, and she offered free hanging baskets to garden club members. Many thanks Rita for your major contribution to the garden club. Manawee gave a beautiful cyclamen plant for our Raffle, which was run by Maxina Williams and helper Anne Colville. Cut Flower Photos and results are separate as a subheading under this "Meetings heading. The Guest Speakers this month were Buderim Garden Club members Kevin Hamment and Daphne Ludwig, speaking about Anthuriums. This couple are qualified judges, as well as winners of many competitions, including a 1st at the Brisbane Royal show. Daphne did most of the talking with many comments directed to dutiful Kevin. Their excellent power point presentation and pot display increased our knowledge of the many different types of anthuriums,. Kevin demonstrated how they propogate these plants and the potting methods that they use. Kevin is also the organiser of the Combined Garden Club picnic day on May 30th, and so told of the top attractions that his committee have organised. A bus has been organised to take members to this great day. The member speaker was Elaine Davidson who showed how she transformed a dreary, paved backyard into a colourful flowering canopy and garden - in 4 years. The Guest Speaker this month was Kim Martin from Bio Organic Sustainable Solutions, who gave a most informative talk and power point display concerning how microbes and elements in the soil are essential for good plant growth. (She claimed that she had turned a stick into a healthy plant with use of the GROW BOSS products). Our Guest speaker Co-ordinator, Jenni Campbell presented Kim with a "thank you" gift. At the April meeting, we were told that Manawee nursery now stock the GROW BOSS products. 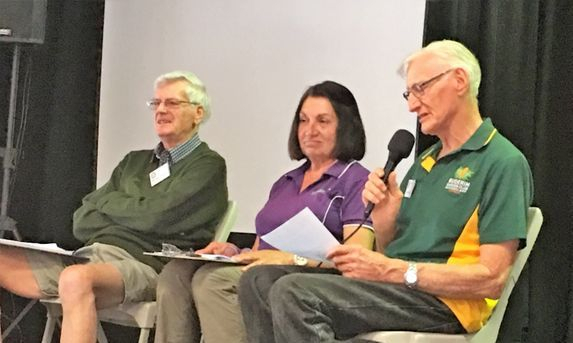 The Member's talk was in a different format this month, with a panel of our gardening experts answering members' questions about Pests in the Garden. The three wise men in the panel chosen on this occasion, were Steve Wikman, Ken Evans and Robin Porter. They enlightened us with cures for grasshoppers (pine0clean in a diluted spray), bulb caterpillars (use the index finger and thumb and squash them) and large toys amongst the garden to deter bush turkeys. 'Twas enjoyable and we learnt a lot. The Cut Flower competition produced some high class specimens, including a black bat flower. The above photo shows the 8 Walkers who show the winning entries to the audience. Photos and results are separate as a subheading under this Meetings heading. At February's general meeting, the Buderim hall was packed with members and many visitors. President John Lyon welcomed everyone, and many plants were sold, cut flowers were exhibited, library books were exchanged, lovely raffle prizes were won, and gossips were shared at afternoon tea time. Our guest speaker was Bob from Rare Plants Boutique nursery, Nambour, and then Barry Sullivan spoke about the Bunchy Top disease which affects banana plants. The Cut Flower competition had many beautiful entries. Shirley McDonald is back in charge, and Steve Wikman announced the winning entries for The Flower Parade, which is always an interesting spectacle. "Cut Flower Results" and photos can be viewed from the subheading under the "Meeting" title above. Marjorie Van Roy, Robin Porter.